Twiggs Money Flow is my own derivation, based on the popular Chaikin Money Flow indicator, which is in turn derived from the Accumulation Distribution line. We are all indebted to Marc Chaikin and Larry Williams for the contribution they have made to the field of technical analysis and price-volume oscillators. frequent closes in the top half of the daily range. frequent closes in the lower half of the daily range. If price gaps up or down and then closes mid-way between the day's high and low, the indicator records no change. It does not account for gaps. CMF also has a tendency to "bark twice". The formula sums Accumulation Distribution for 21 periods and then divides the total by the sum of volume for the identical period. This is very effective in highlighting short- to medium-term accumulation and distribution but leaves the user with the same failing as a simple moving average: unusually high or low data affects the indicator on the day it is added to the indicator period and on the day it is dropped from the calculation. This is far more critical with the money flow indicator than with a moving average and users may witness a surge in the index that is totally unrelated to current price/volume behavior. 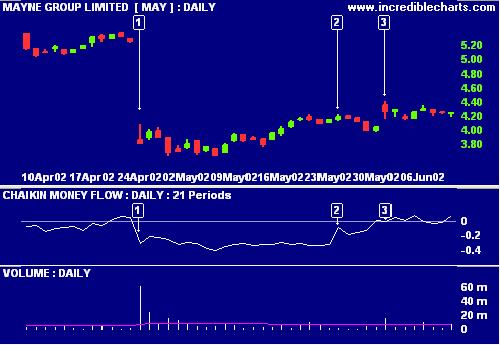 Mayne Nickless (Australia) is plotted with Chaikin Money Flow and Volume. Chaikin Money Flow drops sharply at  as the stock gaps downward on exceptionally high volume, indicating distribution. 22 days later at , Chaikin Money Flow jumps upwards when the data on day  is dropped from the indicator window. There is no unusual volume or price event on day . Price gaps up with strong volume but Chaikin Money Flow dips - because the close is below the mid-point between the day's high and low. The gap up is ignored. To solve the problem with gaps, Twiggs Money Flow uses true range, rather than daily Highs minus Lows. And, rather than a simple-moving-average-type formula, Twiggs Money Flow applies exponential smoothing, using the method employed by Welles Wilder for many of his indicators. Mayne Nickless (Australia) is plotted with Twiggs Money Flow and Chaikin Money Flow. The stock gaps downward at  on exceptionally high volume. Twiggs Money Flow and Chaikin Money Flow drop sharply, indicating distribution. 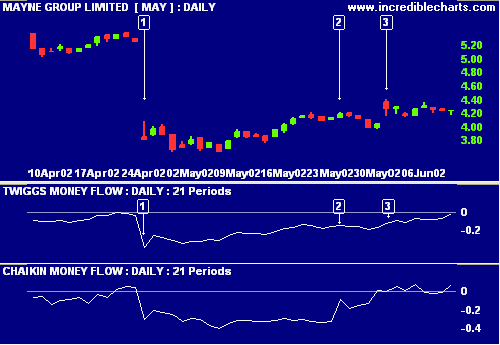 There is no unusual volume or event 22 days later at , reflected by the smooth indicator line on Twiggs Money Flow. By contrast, Chaikin Money Flow jumps up sharply at  when day  data is dropped from the indicator calculation. Price gaps up on day  with above-average volume. Twiggs Money Flow rises because of the upward gap while Chaikin MF dips (because the Close is below the mid-point between the day's High and Low). 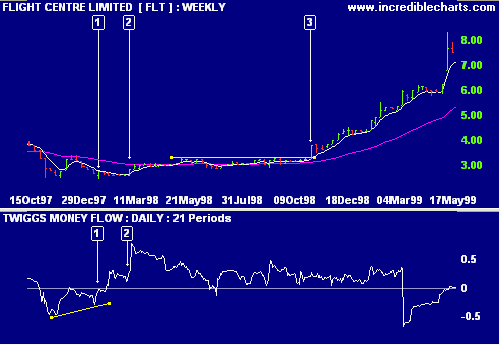 Flight Centre (Australia) with 150-day and 21-day Exponential Moving Averages and Twiggs Money Flow. Go long at  on bullish divergence. Twiggs Money Flow has respected the zero line, forming a trough above zero; strong confirmation of the earlier bullish divergence. Go long at  on breakout above the resistance level (new 6-month high). Twiggs Money Flow has barely crossed below zero in the 10 months prior to the breakout - an exceptionally strong accumulation signal. Beware of large volume spikes - on Twiggs MF or Chaikin MF. A gentle slope back towards zero is not a divergence but is caused by the exponential smoothing: the indicator will tend towards zero, over time, in the absence of other factors. Where there is any doubt about a divergence, check with a longer-term Twiggs MF indicator. Pan Pharmaceuticals with 21-day Twiggs Money Flow and 100-day Twiggs Money Flow. 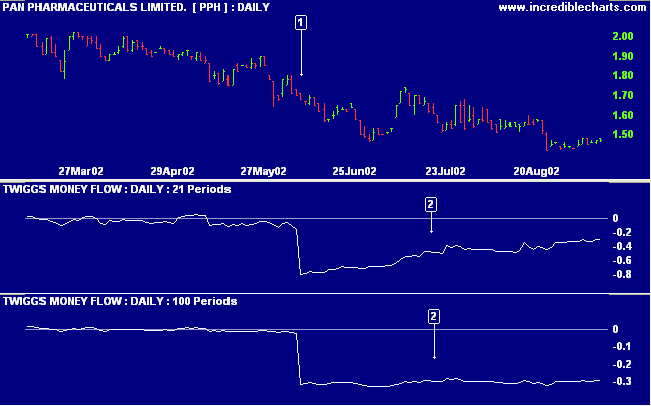 A large volume spike (more than 40 times average daily volume), while PPH is trending lower, causes Twiggs Money Flow to drop sharply. The gradual upward slope on the 21-day Twiggs MF over the next three months is not a bullish divergence but the result of exponential smoothing: the indicator tends towards zero, over time, in the absence of other factors. This is best illustrated by the longer-term 100-day Twiggs Money Flow which remains almost completely flat over the same period. Basically, True Range High (TRH) is the greater of today's High and yesterday's Close. 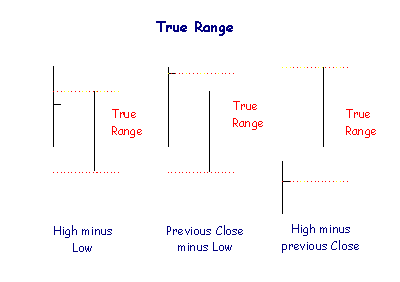 True Range Low (TRL) is the lesser of today's Low and yesterday's Close. Repeat this process for each subsequent day**. TMF uses Welles Wilder's formula for calculating an exponential moving average. Wilder not use the standard exponential moving average formula. See Wilder Moving Average. A 14-day Wilder moving average is equivalent to a 27-day exponential moving average using the standard formula. Some observant readers have questioned why Step 3 is not divided by 21 days, to create an exponential moving average. The same applies to Step 4. You will note that Step 5 divides the result of Step 3 by Step 4. Division of the numerator (Step 3) and the denominator (Step 4) by 21 is therefore redundant: the one offsets the other. This leads to another question: Why are AD (Step 3) and Volume (Step 4) not divided by 21? If we take Step 4 as an example, V is the sum of 21 days of volume. If we want to add the next days Volume, we must remove one days Volume from V, to keep the total constant at 21 days. We do this by multiplying V by the fraction 20/21. Twiggs Money Flow = AD / V expressed as a percentage. ® MetaStock is a registered trademark of Equis International in the United States and other countries. Twiggs Money Flow is a proprietary indicator. Readers are permitted to explain/describe Twiggs Money Flow on other websites/publications and/or to include/reproduce the formula in other software provided that they display a hyperlink to this web page. Bollinger Bands Trends Capture trend momentum with Bollinger Bands and Twiggs Money Flow. Colin Twiggs About Colin Twiggs, author of the Trading Diary and Incredible Charts website. Chaikin Money Flow Developed by Marc Chaikin, the Chaikin Money Flow indicator often warns of breakouts and provides useful trend confirmation. Money Flow Index Money Flow Index measures trend strength and warns of likely reversal points. It is practical. It is not crammed with theories. Theories usually lose you money. The more you believe one theory, the more you will lose. Professional traders are unique in one simple way: they tend to make money over time. Most importantly, when they lose money, it is a small percentage of their trading capital. This one quality, losing a little when a trade is not successful, is the true earmark of the professional. Description Profiled in Worth Magazine as one of the four investment classics of all time, this fictionalized biography is among the most compelling books ever written on trading in the markets. Penned in 1923, the text remains timeless because it captures a trader\'s mind so accurately, the recollections of mistakes, lessons learned and insights gained. 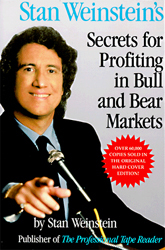 Packed with observational gems about the markets and trading. 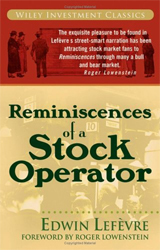 \'Whilst stock market tomes have come and gone, this remains popular and in print eighty years on.\' First published in 1923, Reminiscences of a Stock Operator is the most widely read, highly recommended investment book ever. Generations of readers have found that it has more to teach them about markets and people than years of experience. This is a timeless tale that will enrich your life-and your portfolio.